Stephen Olner is best known to readers of Texoma Living! as the photographer who covers most of the major events for our party pages, and for his architectural photography on the pages of our Style section. He is one of those immigrants we don’t hear so much about—coming across the Atlantic, rather than the Red River. Two years ago, Stephen came to visit America and stayed. Now a legal alien and married to a U.S. citizen, Stephen Olner has fully immersed himself into American culture. Living across the Texas border in Colbert, Oklahoma with his new wife, stepchildren and new baby girl, Stephen has found that adventures are often found as close as the backyard. “I never intended to become a beekeeper, amateur or otherwise,” said Olner. “Helping a friend clear some property we cut down a good-sized tree and when it was on its side we noticed a bunch of bees swarming around a hole.” A chainsaw cut revealed at least 10 feet of bees and their honey. Olner finally managed to cobble together the essential gear—netted suit, head covering, smoker— and set up shop in the backyard with two boxes. Unfortunately, the stress of having its hive disturbed and perhaps Olner’s own inexperience, the bees did not survive. Spring has arrived and a new colony of bees is hard at work, flying from their base station in Olner’s backyard, becoming familiar sights on neighbor’s flowers. Stepchildren Shelby and Sara have their own hives, each decorated by its keeper. » Foragers must collect nectar from about 2 million flowers to make 1 pound of honey. » The average forager makes about 1/12 th of a teaspoon of honey in her lifetime. » Average per capita honey consumption in the US is 1.3 pounds. » Bees have 2 pairs of wings. » The principal form of communication among honey bees is through chemicals called pheromones. » Bees are important because they pollinate approximately 130 agricultural crops in the US including fruit, fiber, nut, and vegetable crops. Bee pollination adds approximately 14 billion dollars annually to improved crop yield and quality. » Get away from bees as quickly as possible. » While running away protect your face and eyes as much as possible. » Take shelter in an enclosed area such as a car, truck, or a building. 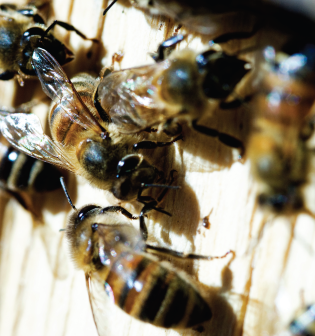 » Call a local beekeeper, pest control company, or local cooperative extension agent for assistance. » Do not hide in water or thick brush. » Do not stand still and swat at bees; rapid movements will cause them to sting. Africanized honey bees are well established in the wild population of honey bees in Texas. The Africanized bee is a hybrid (mixture) of African and European honey bee subspecies. Both are not native to the Americas. As a hybrid the Africanized bee appears identical to European honey bees. Individual foraging European and Africanized bees are highly unlikely to sting. A swarm rarely stings people when in flight or temporarily at rest. However, established Africanized colonies are more highly defensive toward perceived predators than European colonies. » Respond quickly to disturbances by people and animals 50 feet or more from the nest. » Sense vibrations from power equipment 100 feet or more from the nest. » Sting in large numbers. » Will chase an enemy up to a ¼ mile or more. » Have a higher rate of reproduction (swarm more frequently). » Nest in smaller cavities and sometimes underground (e.g. water meters and animal burrows). Find these resources and much more online at http://honeybee.tamu.edu.